Make your light colored vehicle shimmer like diamonds! Poorboy’s World White Diamond Show Glaze for Light Vehicles hides light imperfections and improves gloss to give your vehicle a show car shine! Apply Poorboy’s World White Diamond Show Glaze any time to conceal minor blemishes between details. All white, silver, and light colors will shine like diamonds! 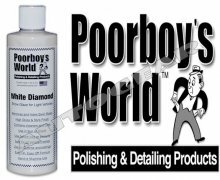 Poorboy’s World White Diamond Show Glaze for Light Vehicles contains gentle cleaners to lift dirt and oil out of fine swirls. By cleaning the swirls, they appear less noticeable. Fillers then conceal the swirls to create the illusion of perfectly smooth paint. Once a wax or sealant is applied, your vehicle will look flawless! Poorboy’s World White Diamond Show Glaze for Light Vehicles is perfect for daily drivers. Daily wear and tear can result in more swirls, but you can’t polish your car every weekend! Poorboy’s World White Diamond Show Glaze allows you to conceal those imperfections between major details. Poorboy’s World White Diamond Show Glaze for Light Vehicles looks incredible on all light colors, and can even be applied to chrome and show plating! Poorboy’s World White Diamond Show Glaze for Light Vehicles is an easy to use product. Spread it with a soft, clean foam applicator,(if applying by machine, set your polisher to a low speed) and work until a shine begins to appear. Allow it to dry to a haze and then buff off with a clean, soft microfiber towel like our DMT or Mega-Plush towel. If your vehicle has more severe swirls and scratches, use Poorboys swirl removers to perfect the paint. Then apply Poorboy’s World White Diamond Show Glaze to improve gloss. Finally, top the paint with Poorboys World EX-P Sealant or Natty’s Paste Wax. Poorboy’s World White Diamond Show Glaze for Light Vehicles makes it easy to maintain a show car perfect shine all the time! Wipe it on, let it haze, buff it off, then enjoy the shine. Brand New in a Bottle.